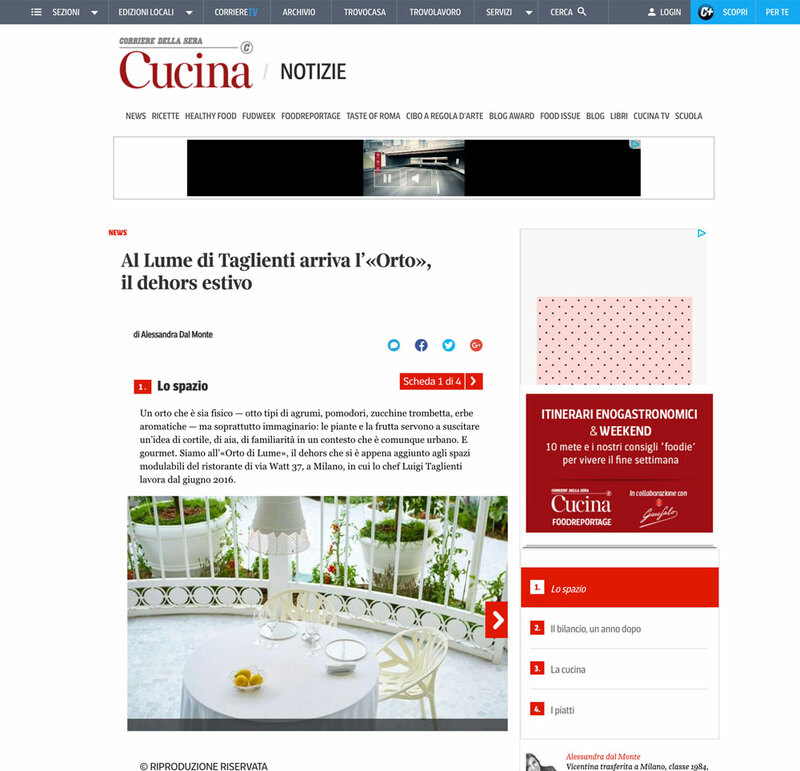 Michelin-starred restaurant LUME, Milan (Italy), announces the opening of its al fresco area - Orto di LUME - after an extremely successful first year. Since opening in June 2016, with Executive Chef Luigi Taglienti, the restaurant was awarded its first Michelin star just 6 months later, and more recently was announced as the Best New European Restaurant at the prestigious OAD Awards, held in Paris in May. "We are excited for the next stage of the restaurant’s development" said Marco Bruzzi, Managing Director at LUME. "It was always a part of our plan for the restaurant. The Orto di LUME has been completed on time and ahead of schedule, with no interruption to the day-to-day service." 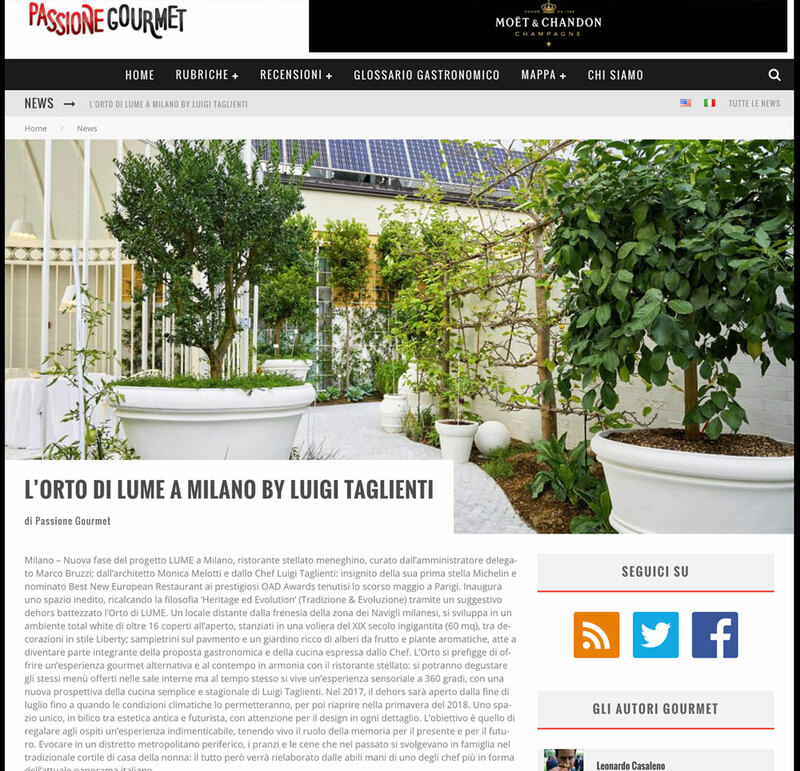 The restaurant’s new outdoor area is a mesmerising spectacle - a calming white, grey, and green oasis away from the busy streets of Milan’s Navigli district, in which LUME is situated. Within the rectangular 160 sqm outdoor area, the focal point is a large 60 sqm birdcage,in which guests are seated. Here they can order from the same menus offered inside, but also benefit from a "5 sense experience". Surrounded by the plants that bear the fruits of many of the dishes’ core ingredients, such as lemon, basil, rosemary and many more, guests gain a further insight into Executive Chef Taglienti’s simple and seasonal approach to cooking, and are able to recognise the innovative techniques used in LUME’s kitchen to transform these ingredients into dishes that surprise and delight. The al fresco area adds an additional 16 covers to the restaurant’s current 40. There are four circular tables, with the capacity to seat up to 4 people per table. The area will be open from today until weather permits in 2017, and will open again in Spring 2018. 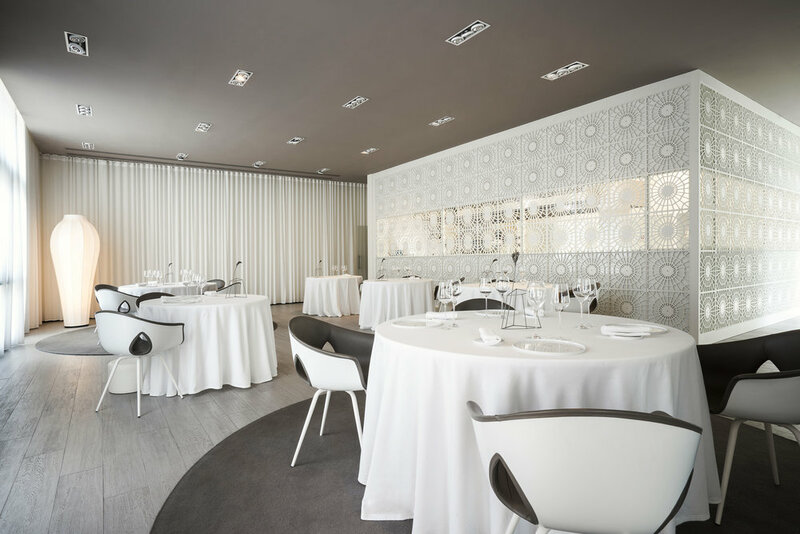 In everything that makes up the LUME experience – the design, the food, the service and the W37 building in which it sits – the dualistic themes of heritage and evolution are present. The new al fresco area gives guests the opportunity to experience what LUME is about in an alternative environment. Indeed, just as Executive Chef Luigi Taglienti’s food honours the importance of history and tradition, while at the same time offering something totally new, the design of LUME both indoors and outdoors and the features that form part of the restaurant’s aesthetics recall the memory of the past but are, at the same time, forward-looking. The use of the oversized 19th Century bird cage, the Art Nouveau style decorations on the walls and the square stone pavement in the garden are all elements from our past. However, all these decorations have been adapted with a modern, futuristic twist. For example, the birdcage, vastly out of proportion compared to the space in which it sits, is used as a container, and an apple tree, a historic symbol of the fruits that the past can bear, is an espaliered apple tree that grows as a beautiful work of art against the wall. Commenting on what inspired her design of the Orto di LUME, Architect Monica Melotti said: "At LUME, our goal is to give guests a truly memorable experience, but we also want to encourage them to remember the vital role of memory in both our present and our future. I wanted to transport those dining in the Orto back in time, into a traditional Italian grandmother’s backyard in an outlying metropolitan district. 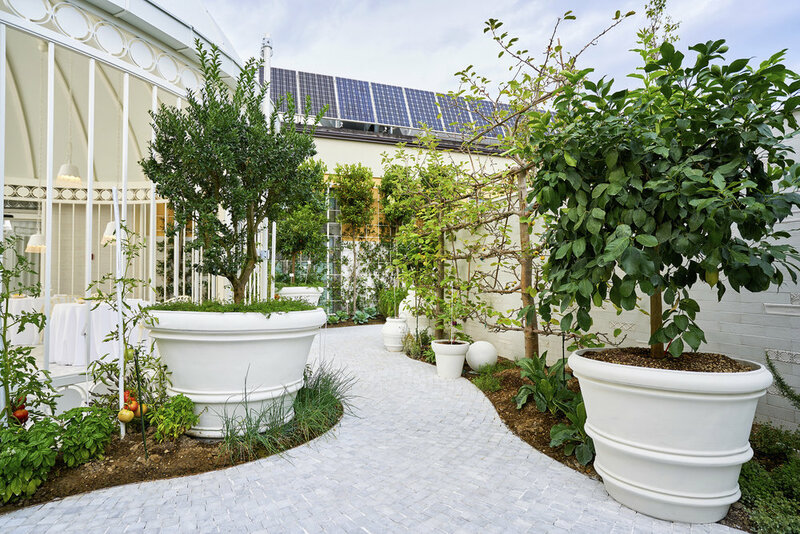 Many of the features that I have chosen to place here are reminiscent of exactly this, but have been reinterpreted; such as the painted white terracotta pots, a garden with edible plants instead of flowers and the 19th Century birdcage."